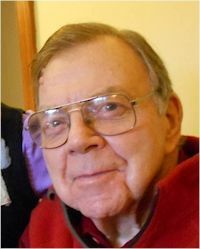 Peter Brian Lumb, 85 yrs of age, of Vancouver and previously of Wiarton, Ottawa, Sarnia and Yorkshire, died Wednesday March 18 2015 in Vancouver. Peter was born in Keighley, Yorkshire to Clara and Frank Lumb. His life was filled with adventures reflecting his love for family, the outdoors, volunteering and other good things like wine, travel, and fishing. Peter grew up in Yorkshire where his family had worked in textile mills for generations. He earned a scholarship to Oxford where he completed his Chemistry D.Phil, ran and rowed for Oxford and found a beautiful nurse to row on the Thames with. He and Doreen married and immigrated to Canada in 1954. He worked in technical and business development management positions at Polysar, Atomic Energy of Canada, and with the federal government before retiring to “the cottage” on Lake Huron. Peter dedicated many volunteer hours to his community, most notably to xc skiing and to Trinity Anglican Church, in Wiarton. He was a dedicated husband and father and loved to teach his grandchildren about ‘cottage life’ including sailing, fishing, hunting, and many other outdoors activities. He gave all his children a love of the outdoors and physical activity, as well as a strong belief in lifelong learning. We will miss his kind smile, his chuckle, and his sincerity. Peter is survived by his wife, Doreen, his 5 children, Catherine Baier, Christopher Lumb (Kathy), Janet McKeown (Martin), David Lumb (Shelley), Adrian Becklumb (Penny); grandchildren, Christina, Michael, Brendan, Farran, Rowan, Aileen, Monica, Adam, Kieran, Katia, Georgia and Juliet; and great grandchild, Caitlin. He is predeceased by his sister, Margaret. A memorial service was held, March 24th at St. Helen’s Anglican Church, Vancouver. Doreen welcomes anyone who wishes to say a few words or share stories during Peter’s Celebration of life.